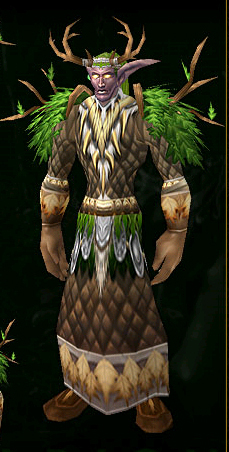 Admittedly this Druid set is one of the more polarizing sets ever released as evidenced by its 2005 nickname, the “wandering bush”. However in its defense, and in keeping with Blizzard’s unhealthy obsession with silhouette identification, this set most certainly fits the class as 100% Druid. You have to give points for the distinct “woodsy” vibe that the set gives off and I absolutely certain that there is a Druid or out there who would proudly wear this set (and ride their Talbuk)! Let me just slide into this hedgerow... ah invisible! This entry was posted on May 12, 2011 at 10:16 pm and is filed under General, MMO, Role Playing, World of Warcraft. You can follow any responses to this entry through the RSS 2.0 feed. You can leave a response, or trackback from your own site. Love the helm and shoulders. And yes my druid would be happy to wear them. Thank goodness, finally something that a druid would actually wear! None of this, feathers falling and lighting crap. I likie!